WANG Qianwen, XU Zhenhua, WANG Zhijing, SU Rongjian, CHEN Xuejun, GU Yanjiao. Effects of Glucose-regulated Protein 78 on the Sensitivity of Non-small Cell Lung Cancer Cells Harboring the L858R Mutation to Erlotinib[J]. Journal of China Medical University, 2018, 47(8): 701-704. Abstract: Objective To investigate the effects of glucose-regulated protein 78 (GRP78) on erlotinib sensitivity of L858R mutation-positive non-small cell lung cancer. 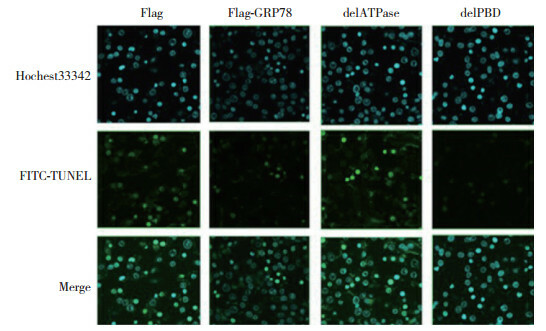 Methods The expression of GRP78 and its mutants in H3255 cells was altered using a gene transfection technique. The inhibition of cell proliferation by erlotinib was detected by MTT assay. 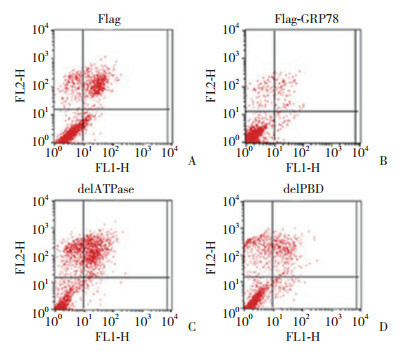 Apoptosis was analyzed by flow cytometry and fluorescein isothiocyanate-terminal deoxynucleotidyl transferase dUTP nick-end labeling(FITC-TUNEL), and an immunoblotting technique was used to detect the expression and phosphorylation of epidermal growth factor receptor(EGFR)and extracellular signal-regulated kinase(ERK). 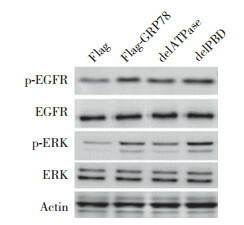 Results Overexpression of GRP78 and its deleted peptide-binding domain reduced the sensitivity of H3255 cells to erlotinib, inhibited erlotinib-induced apoptosis, and promoted the phosphorylation of EGFR and ERK. Conclusion GRP78 promotes resistance to erlotinib in non-small cell lung cancer cells through its ATPase domain.